NO TRAINING IN OVER A YEAR – Are Orihuela police safe to carry firearms? Orihuela’s Local Police refuse to carry out any weapon handling drills outside the city as they continue to reject a proposal by the Councillor for Security, Mariola Rocamora, to travel to the Shooting range in Elche. As such, since the closure of the Orihuela Range over a year ago, Police Officers in the city have not carried out any live firing exercises, despite being called upon to carry their weapons on a daily basis. Anywhere else this would raise serious doubts about their safety and their abilities to operate their weapons without presenting a danger to the public, but in Orihuela that seems not to be the case, as the Security councillor pushes forward with measures that the police unions continue to reject. Police unions, UGT, SPPLB and CSI-F, have repeatedly told the councillor that they will only use the range in the Orihuela police station, but the facility remains closed because of her refusal to pay for liability insurance. 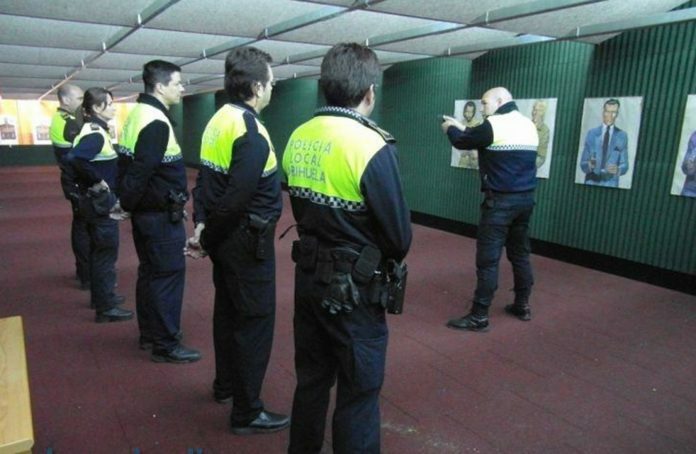 They say that the councillor intends to spend 6,000 euros to send the officers to the range in Elche, a move which the unions say is illegal in so far as any practical or theoretical training must be carried out by the corresponding Local Police Department, which in the case of Orihuela has it’s own firearms Director and 4 instructors, so the training cannot legally be done by any other personnel. Currently regulations require that firearm practice must be carried out by all officers twice a year but during 2018 there was none at all. However unions continue to insist that the training must be carried out exclusively in the premises of the Local Police Station in Orihuela, in the shooting gallery that is currently closed. Are Orihuela police safe to carry firearms?